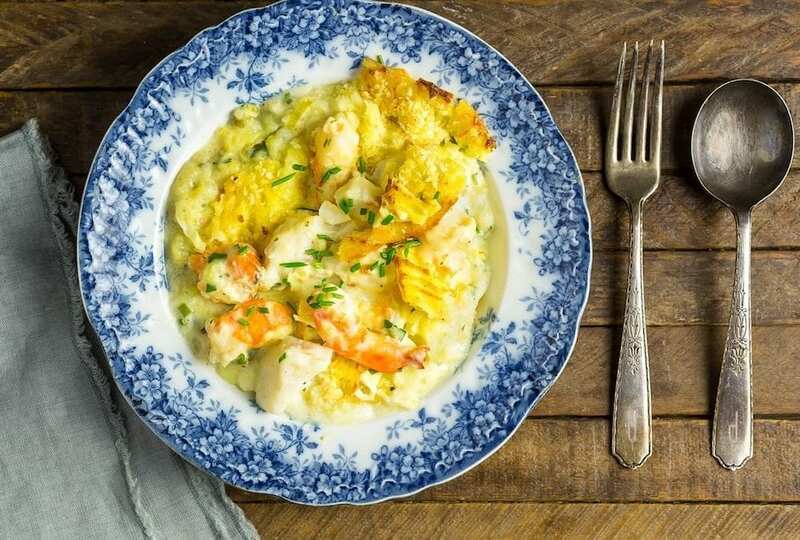 Fish pie might seem like an essentially British recipe, but there’s no reason why it can’t be made in America. 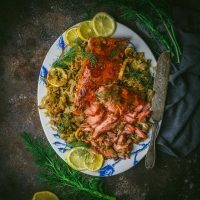 By finding your best local options for fresh fish (or a fantastic on-line resource like Sizzle Fish) and using your grill or smoker to enrich salmon, you’ll end up with a great catch! It’s a funny thing, food writing. 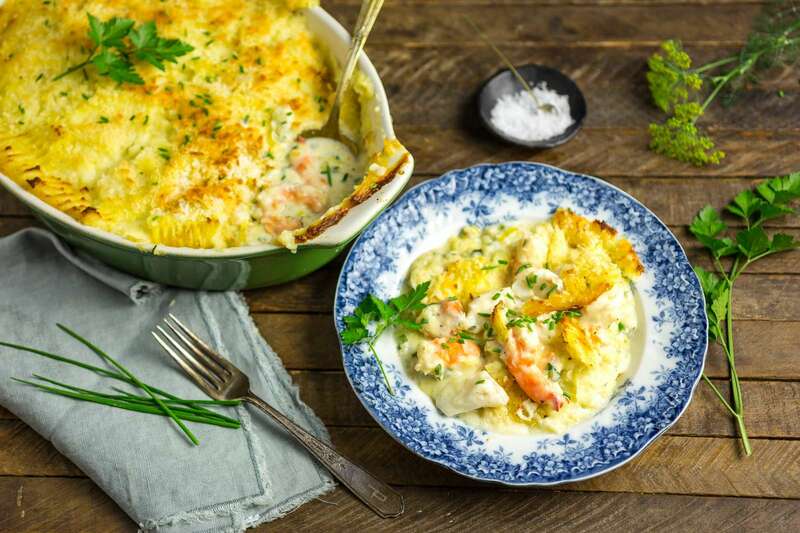 Cooking has so much potential to bring people together, but recipes can also create rifts of disagreement that can simmer for years (OK, rifts don’t simmer, but, you know what we mean). As a case in point, a while back we posted a basic recipe for pasta, minced beef and tomato sauce that in Emily’s family had gone by the name of “gamush” since time immemorial. 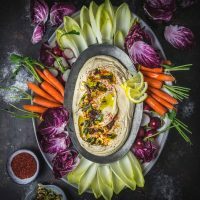 We hadn’t exactly imagined it would lead to a kum-ba-yah reunion, but we got two swift pieces of feedback from opposite ends of the family, both claiming that they had invented it, and both mentioning that we had gotten the recipe quite wrong (but in different ways). 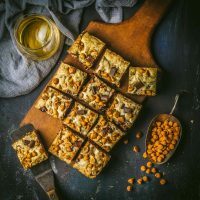 Posting a variation on a favorite recipe can be like tackling a religion – you’re going to get diehard believers who have A Correct Way to make something and no deviation will be tolerated; and there are more casual members of the church who don’t really mind what you do with the recipe so long as you don’t put raisins in it. 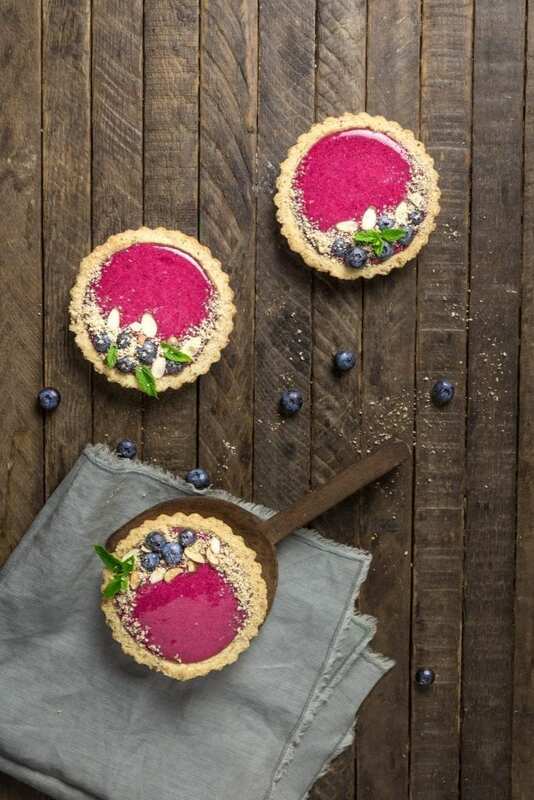 The perfect use for our gorgeous pink blueberry lemon curd, these pastry tartlets are flavored and decorated with almonds. Each tartlet is a miniature delight, yet sufficient to share with a loved one (or keep to yourself, of course, you gannet). When we saw how striking our blueberry lemon curd turned out, we knew it wouldn’t be enough simply to slather it on some toast (as delicious as that might be). 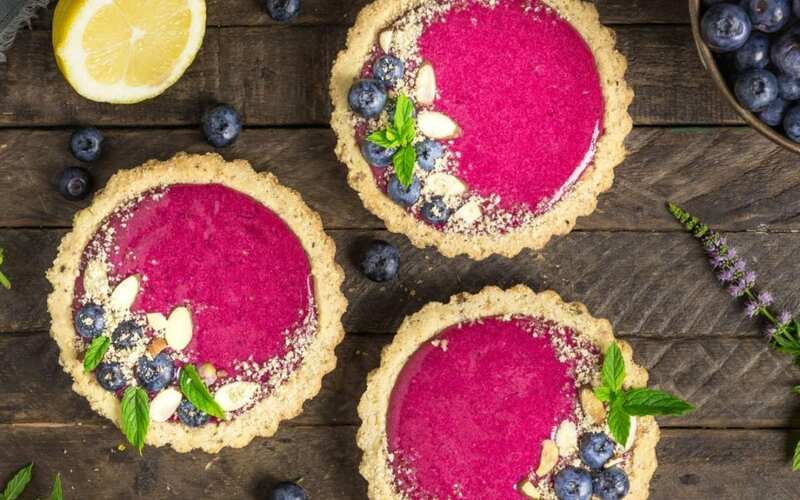 Something that gorgeous and cheeky deserved to be showcased – and this was our solution: adorable little blueberry lemon curd tartlets. 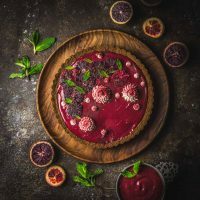 A shortcrust base generously flavored with ground almonds and a little fresh rosemary, pre-baked, cooled, and filled with the curd, which we decorated wth more ground and sliced almonds, some fresh blueberries and a few flowering mint sprigs. 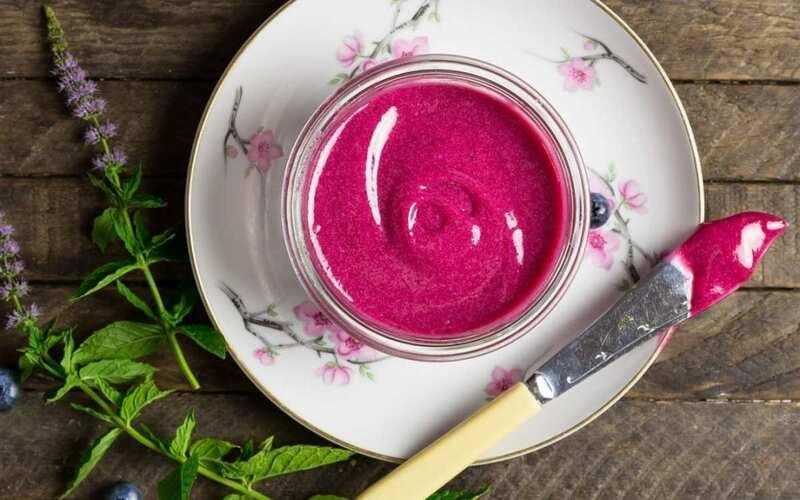 Blueberry lemon curd: take our already delicious and zingy lemon curd, add blueberries, and you have yourself a shockingly colorful and brilliantly tasty fruit curd that will dazzle your breakfast table. Don’t you hate it when your favorite site or publication has a “special takeover issue”, when they change the title and mess with the format purely for the purposes of advertising or to big up their latest feature? I didn’t like it when Whizzer and Chips did a “Chips and Whizzer” edition in 1979, and I don’t like it now. That’s the reason why we’re not temporarily changing the name of the site to “Curds with Knives” because, frankly, otherwise, that’s exactly the sort of thing we’d do. I don’t know if it’s the fact that lemon prices have dipped lately, I know it’s not because we have a glut of eggs (because out of seven chickens, only one of them is laying) but for some reason, we’re getting rather obsessed with making lemon curd and variations thereof. If you grow your own summer squash, or belong to a CSA, the weekly glut of produce can be overwhelming. Our solution? Shred it, squeeze it, mix into a cheesy batter and fritter it away. Literally. If you grow your own summer squash, zucchini can sometimes feel like a plot device in a horror sci-fi movie. At the beginning of the season, you carefully harvest the first zucchini, cradle it like an infant and rest it with pride on the cutting board. The next day, you have two more, and with the proud thrill of the backyard farmer, you slice and grill your summer bounty. The next day you have two more, and two more the following day. By the end of the first week of peak zucchini, you’re nervously eyeing the stack of squash that has built up on the kitchen counter, wondering how many more friends you can gift your harvest to before even they stop answering the door. And woe betide you if you skip checking for a few days – when you return to the garden and lift up the lowest squash leaf, you’ll inevitably find one monster marrow lurking like a squat green fiend. 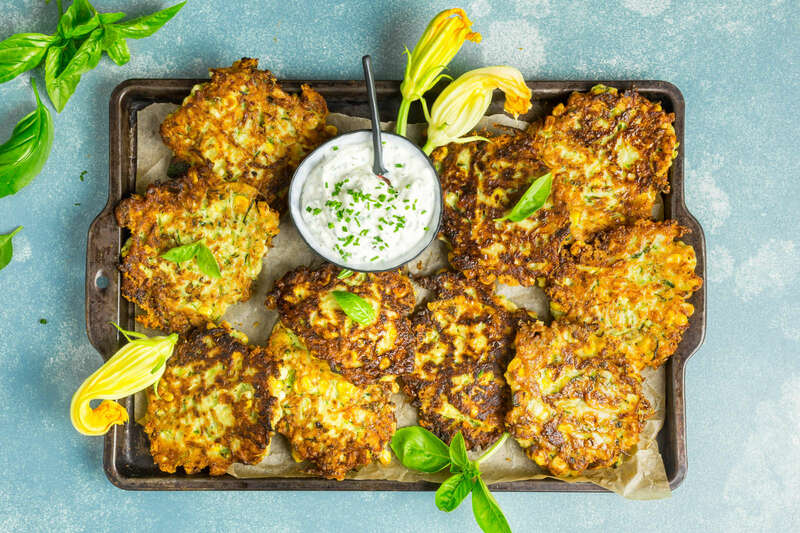 Note: We originally blogged zucchini fritters back in 2013, when we were all a little more fresher of face and bouncier of step. 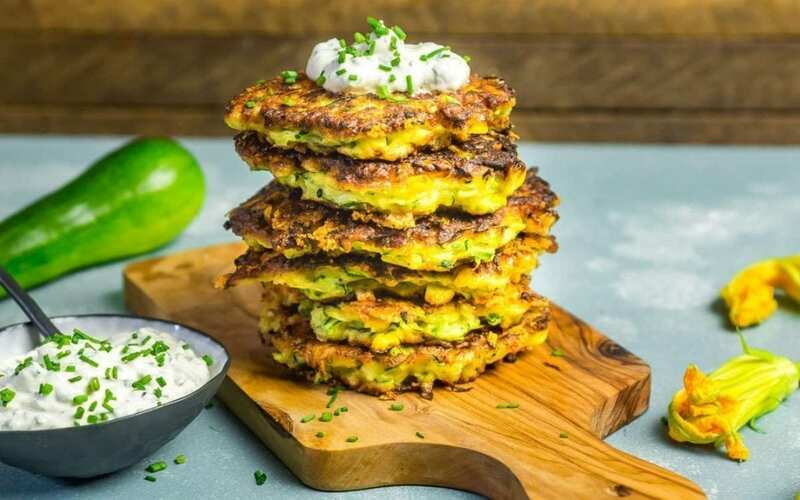 We make these fritters all the time in the summer, and we’ve adapted the recipe by adding fresh corn and cheese, so we’ve been meaning to re-blog this recipe ever since. So finally, here is the updated article. 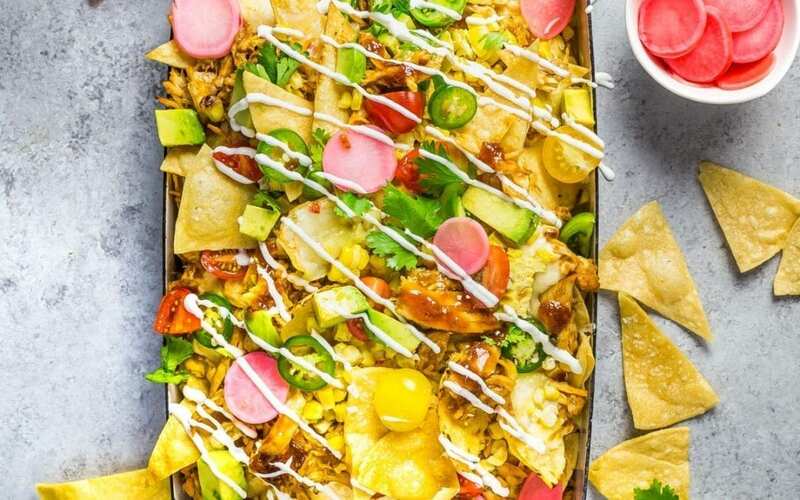 We take what we love about most about nachos (crunchy chips and an unapologetic amount of cheese) and loaded them up with the best flavors of summer. Grilled corn, fresh tomatoes, avocado, pickled radishes and shredded chicken with bourbon-brown sugar BBQ sauce. I don’t know about you, but spring was something of a damp squib. It seemed to rain pretty solidly throughout April and May (you know the old rhyme: “April showers, May even more showers, let’s just forget about June entirely”) and while the garden is now as lush as it’s been in years (“July – finally! – flowers”), we hadn’t had much of a chance before the outset of summer to get out there and enjoy it. Now, at last, the heat is on, the tees and shorts are in rotation, and we’re fully into the swing of the season. Note: This recipe is part of our ongoing collaboration with Serious Eats.